Sunset Air Conditioning & Heating is a locally owned air conditioning contractor that sells, installs, repairs, and maintains heat pumps and air conditioning systems throughout Fort Myers, Cape Coral, Naples, and surrounding areas. We hold a class A air conditioning contractor license and are fully insured. Our indoor comfort experts have decades of experience and are trained in all aspects of air conditioning installation, maintenance, and repair. They also undergo continuous factory training and attend a variety of industry-related seminars. As a testament to our quality service, we have thousands of satisfied clients and an A+ rating with the Better Business Bureau. Whether you want to upgrade your air conditioner, repair an existing one, or prepare your system for the summer months, Fort Myers residents can count on Sunset Air Conditioning to provide reliable service at an affordable price. We welcome calls any time of day or night to discuss your heating and air conditioning needs in Fort Myers, Cape Coral, Bonita Springs, and other nearby cities. Quotes and troubleshooting assistance are available over the phone for free. Call today. Our team consists of home air conditioning specialists. We pride ourselves on our professionalism and courteousness. All our service vehicles are kept well-stocked with the latest tools and high-quality parts. We're fully insured and Class A licensed. We have 1,000s of satisfied clients from Fort Myers, Cape Coral, Naples, and surrounding areas. We're available 8am to 5pm, Monday to Friday, for scheduled service. We're also available 24/7 for air conditioning emergency repair. We have provided homeowners, realtors, property management companies, and homewatch organizations in Fort Myers with the best value in air conditioning sales, installation, repair, and maintenance since 1997. We never cut corners, never waste our customers' time, and never sell our customers something they don't need. We are committed to meeting or exceeding the expectations of our Fort Myers clients. We treat the homes of our customers with the utmost respect and use drapes and booties to keep our work area as clean as possible. We offer a wide array of competitively priced air conditioning installation packages. Sunset Air Conditioning & Heating provides competitively priced all-inclusive packages for air conditioner installations, replacements, and upgrades for Fort Myers homeowners. Our home AC packages are a great value no matter the size of your home or your preferred brand of air conditioner. At Sunset Air Conditioning, you can choose from Trane, Amana, Goodman, Rheem, and Frigidaire. Our comfort specialists will also help you consider all your options and ensure that you get the air conditioner that is will best meets your needs, budget, and goals. Our standard Fort Myers A/C installation package includes the air conditioner unit, humidistat, thermostat, permit submission, labor, haul away, and a courtesy check-up one year after installation. 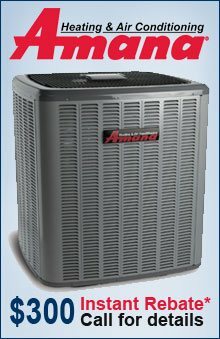 If you are interested in a 16 SEER or higher Trane air conditioner, we will upgrade you to our deluxe package, which includes everything that is in the standard package plus an upgrade to a programmable thermostat, an ultraviolet light air purifier, a surge protector, duct sanitation, and preventative maintenance. We want you to have everything you need to start enjoying a more comfortable home with improved energy savings, and will also customize any of our packages to meet your unique needs. All our air conditioning brands come with limited parts manufacturer warranties, and Sunset also backs all Fort Myers AC installations with its own one-year labor warranty. We also offer the opportunity to buy an extended warranty. If you live in the Fort Myers, Cape Coral, and Bonita Springs area, call today for a free air conditioner sales and installation consultation. We provide over-the-phone or on-site quotes and will also make you aware of any available rebates and financing options. Because our climate fluctuates throughout the year from the low 50s in the colder months to the high 90s in the warmer months, a heat pump can be one of the most cost-effective cooling solutions available in the Fort Myers, Cape Coral, and Bonita Springs area. At Sunset Air Conditioning & Heating, we offer Rheem, Trane, Goodman, Amana, and Frigidaire heat pumps. These brands are known for their high-quality, dependable performance, energy efficiency, excellent warranties, and effectiveness at cooling homes of all sizes and configurations. To help you choose the best heat pump for your home in Fort Myers or other nearby area, call and speak with one of our indoor comfort experts. Over the last 20 years, we have installed thousands of air conditioning and heat pump systems, accruing the expertise and knowledge needed to advise our customers on which unit will best meet their needs for optimal cooling and maximum cost savings. Call today for a free consultation and quote; we'll help you save money, review your best available options, and make you aware of any energy rebates you are qualified to receive. Sunset Air Conditioning & Heating is the contractor of choice for AC repair in Fort Myers, Florida. We have more than 20 years of experience and knowledge to diagnose and expertly repair your home air conditioner or heat pump. Our technicians are highly qualified to repair units made by Frigidaire, Trane, Bryant, York, Lennox, Honeywell, and more. We offer free over-the-phone troubleshooting for your air conditioning or heat pump unit and always do our best to accommodate those who need emergency AC service in Fort Myers, Bonita Springs, Cape Coral, or other nearby area. Sunset Air Conditioning & Heating provides homeowners with AC repair advice they can trust and service they can depend on. Our A+ rating with the Better Business Bureau is a testament to our honest business practices, and the superior customer care we offer. Call us today to repair your home's air conditioner or heat pump in Fort Myers, Bonita Springs, Cape Coral, or other nearby communities. For the best value, Fort Myers, Bonita Springs, and Cape Coral customers can sign up for our service agreement, which includes a semi-annual AC tune-up and additional benefits, such as same-day service and ac repair discounts. Call today to learn more about our preventative maintenance services or to schedule an air conditioner tune-up in Fort Myers, Florida. Sunset Air Conditioning & Heating is a full-service air conditioning contractor with a Class A license and over 20 years of experience. We are qualified to offer the full range of HVAC services to individuals, homeowner associations, realtors, property managers, and homewatch organizations throughout southwest Florida. Our complete range of services includes air conditioning sales, installation, replacement, repair, and maintenance, as well as ductwork cleaning and repair. Call today to schedule your heat pump or air conditioner service in Fort Myers or other nearby city. Our prices are always fair and competitive, and we are happy to provide free over-the-phone troubleshooting and estimates. Not everyone seems to know how to complain, but not very often will someone take the time to acknowledge something good. That is why I want to tell you that your technicians and installers are polite and professional. Our installation was great and everything was very clean. I am very satisfied! Thank you.